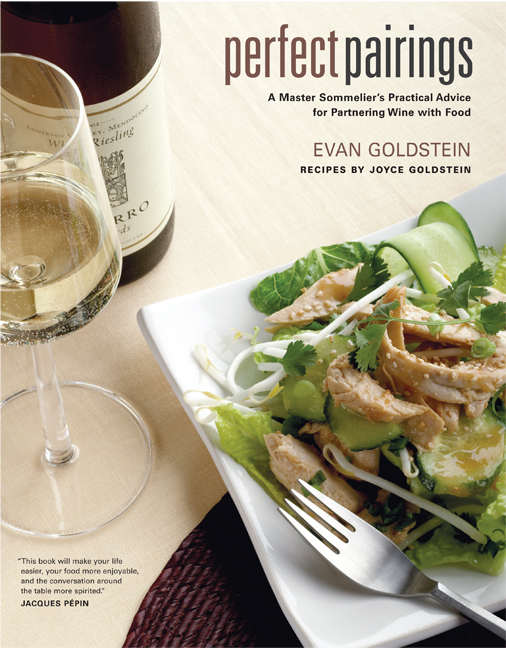 Perfect Pairings combines in-depth explorations of twelve grape varietals, sparkling wines, and dessert wines with guidance about foods that enhance the wide range of styles for each varietal. Whether the Chardonnay is earthy and flinty; rich, buttery, and oak-infused; fruity and tropical; or aged and mature, Goldstein explains how to match it with dishes that will make the wine sing. His clear, educational, and entertaining approach towards intimidating gastronomical questions provides information for all readers, professional and amateur alike. Evan Goldstein, a four time James Beard Award nominee for “Outstanding Wine and Spirits Professional of the Year,” has worked in the kitchens of the Restaurant Le Saintongeais and the Hotel Lancaster in Paris, Auberge du Soleil in Napa Valley, and Chez Panisse Café in Berkeley, California. In 1987 he became the eighth American and youngest ever at the time to pass the prestigious Master Sommelier examination. He is the author of Five Star Service: Your Guide to Hospitality Excellence and has over twenty years experience teaching both professionals and consumers about wine and food. Joyce Goldstein was the chef and owner of the acclaimed Square One Restaurant in San Francisco. She is the author of numerous cookbooks, including The Mediterranean Kitchen, Back to Square One, Kitchen Conversations, and Italian Slow and Savory.